Notes: Based on the manga by Kurata Hideyuki and Yamada Akitarou. An unknown man is found on top of the White House. The police are unable to stop this man, and he, with his unusual powers, destroys the entire building. When asked who he is, the unknown man replies, "I-Jin". He then asks where the Library of Congress is and goes off to steal thousands of manuscripts. Enter Yomiko Readman, a total bookworm whose room is littered with thousands of books in multiple languages. After buying a rare book for a ridiculous sum of money, she is attacked by a swarm of insects summoned by a man who has an interest in the book she is reading and steals it from her. Turns out he is part of a terrorist organization called I-Jin as well, the same people who attacked the Library of Congress and stole all of their books and manuscripts. 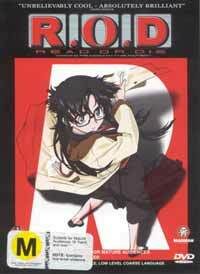 It turn out that Yomiko is actually a special agent for the British Library who has the special power to manipulate paper, and she is assigned to the case of the stolen book along with "Miss Deep", who has the power to phase through objects, and Drake Anderson, a demolitions expert. Together, they go on their mission and find that the stolen book is more important than they think. I have learned a lesson when watching anime. Some titles are not meant to take you to the next level of transcendence or gross you out to no end. Some titles are not meant to be taken seriously, and are there just to give the audience kicks. In the past I always gave those titles lower ratings for NOT being serious. Read or Die has shown me the light! Even if you TRY to take Read or Die seriously, you just can't do it. The whole premise of the plot is hilarious. Three secret agents roam the world and run to the ends of the Earth to look for a *book*!? Then there are the codenames! How can you NOT laugh at names like Yomiko "The Paper" Bookman, Nancy "Ms. Deep" Makuhari, Drake "Mister Drake" Anderson, "Joker", "Gentlemen"?! What I like most about this title is how original it is. Nancy and Yomiko have abilities that rival the X-Men between other DC and Marvel characters. Nancy has the ability to pass through objects without even causing a scratch. And Yomiko is the second person I have seen someone use a briefcase of papers as a weapon (my manager being the first). These special techniques really lay the butter on the bread of this anime, which are action scenes. The fast-paced fights are well animated and comparable to those of James Bond and Charlie's Angels. Of course this is all further enhanced by the seemingly high-budget animation of the three episode series. You have to remember that Read or Die is an action-first movie, like a good chunk of spy thrillers are. While the plot isn't deep and thought provoking, it can still stand on its own two feet. There are enough twists and turns to keep you interested and awake. Yet, even with an unpredictable plot, you STILL can't take it seriously. Even the parts that are intended to be serious make me burst out into bolts of laughter. It's interesting how they have the ability to introduce and efficiently develop characters in 3 episodes. Nancy doesn't even appear in the manga, and she is given a good personality and is probably one of the strongest characters in the anime. She was born for her job it seems. She has tricks up her sleeve along with her unusual technique of passing through objects. Yomiko is a kind-hearted character that cares way too much for her books, and she is definitely a personal favorite of mine. She cute without having eyes the size of watermelons and enough gloss to see your reflection in, which is a tad rare in my opinion. I have only one quarrel with this anime, and that is the fact that you have to be patient when you first see it. I came into this anime with the Gunsmith Cats mindset, so I didn't expect much of a plot. The first episode turned me off for a while, but after scrounging around for the second and third episodes, it became worth the time. The series gets better with each episode. Give Read or Die time to develop, and you will be surprised at how wonderful this title is. Even better is the fact that there is a TV series in production called Read or Dream, that is based off of the manga "Shin Read or Die" by Kurata Hideyuki. Hopefully TOKYOPOP get their hands on the R.O.D. manga. It'll be worth it. Recommended Audience: Nancy has one of the most revealing uniforms that I have seen in an anime: a skintight leather uniform with a long slit down from her cleavage to her belly button. It is obviously made to partially expose her enormously large breasts. Toss the service along with some violence and this is a title that is aimed at the 13+ audiences.